Planetary protection technologies are for cleaning and sterilizing spacecraft and handling soil, rock, and atmospheric samples. In the study of whether Mars has had environments conducive to life, precautions are taken against introducing microbes from Earth. The United States is a signatory to an international treaty that stipulates that exploration must be conducted in a manner that avoids harmful contamination of celestial bodies. The primary strategy for preventing contamination of Mars with Earth organisms is to be sure that the hardware intended to reach the planet is clean. Each Mars Exploration Rover complied with requirements to carry a total of no more than 300,000 bacterial spores on any surface from which the spores could get into the martian environment. Technicians assembling the spacecraft and preparing them for launch frequently cleaned surfaces by wiping them with an alcohol solution. 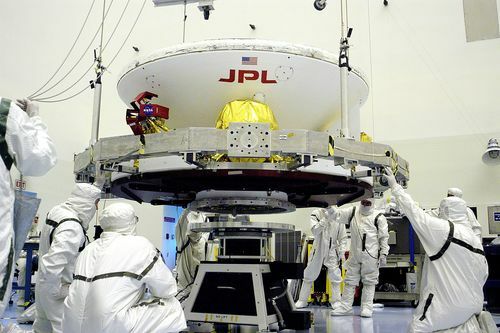 The planetary protection team carefully sampled the surfaces and performed microbiology tests to demonstrate that each spacecraft meets requirements for biological cleanliness. Components tolerant of high temperature, such as the parachute and thermal blanketing, were heated to 110 degrees Celsius (230 Fahrenheit) or hotter to kill microbes. The core box of each rover, containing the main computer and other key electronics, is sealed and vented through high-efficiency filters that keep any microbes inside. Some smaller electronics compartments are also isolated in this manner. Another type of precaution is to be sure that other hardware doesn't go to Mars accidentally. When the Delta launch vehicle's third stage separated from the spacecraft, the two objects were traveling on nearly identical trajectories. To prevent the possibility of the third stage hitting Mars, that shared course was deliberately set so that the spacecraft would miss Mars if not for its first trajectory correction maneuver, about 10 days later.